You don’t have to be a pontoon boat owner to know that today’s pontoons aren’t like the ones that used to putter around local lakes with a few extra folding chairs and Styrofoam coolers. 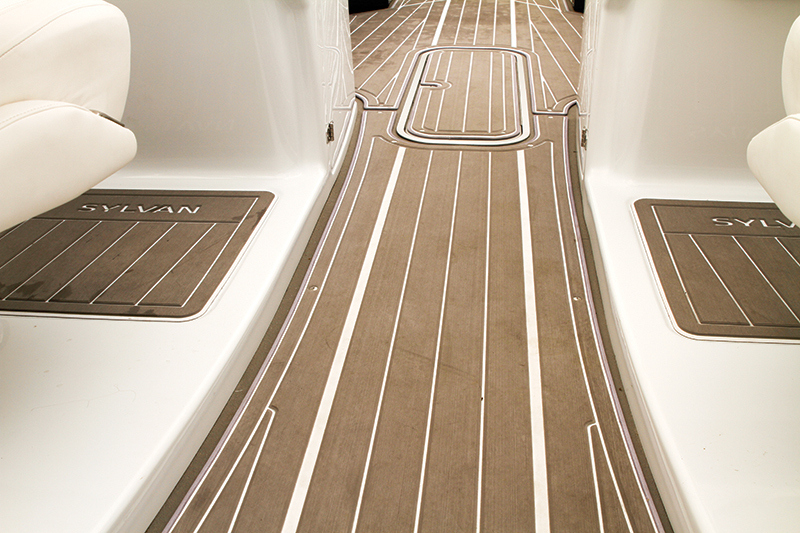 In the last 10 to 15 years, it’s become common knowledge that pontoons are faster and much more comfortable. We also know that the pontoon market is a hot one. After all, baby boomers are retiring en masse, and many seek to downsize and simplify their boating lifestyle while also accommodating more passengers, from grandkids to pets. That’s true, but it’s not the real headline. For that, we need to look at the younger end of the market. 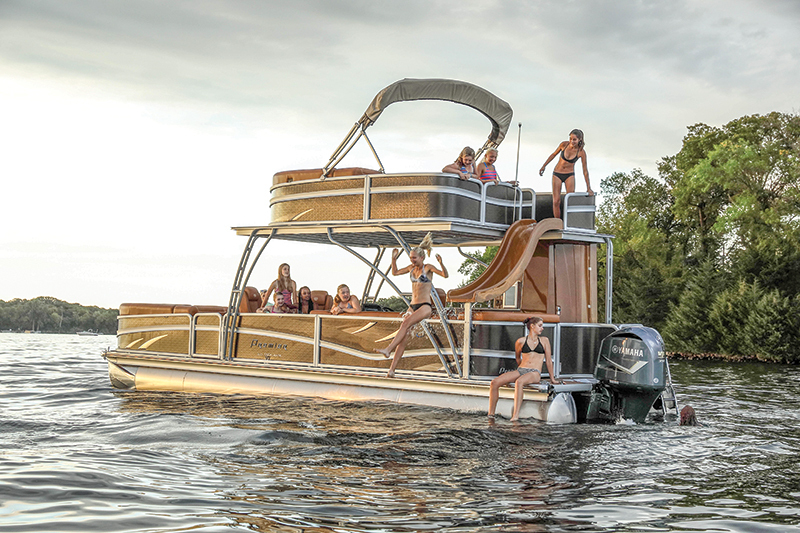 Gen Xers and the first wave of Millennials are converging on pontoons, and thanks to some of the newest innovations and design trends, these versatile, next-generation watercraft are finally welcome at the cool kids’ table. 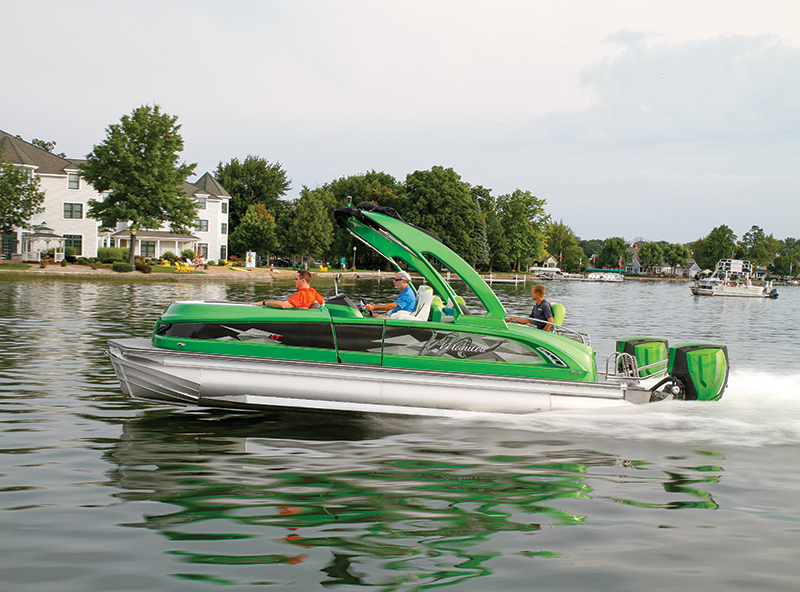 Some manufacturers, such as Manitou Pontoon Boats, are producing models with an all-fiberglass exoskeleton instead of the traditional aluminum fencing and insert panels. Not only do they offer durability, they have a sleek, bold shape that is a major departure from their predecessors. Other manufacturers use a combination of aluminum and fiberglass. 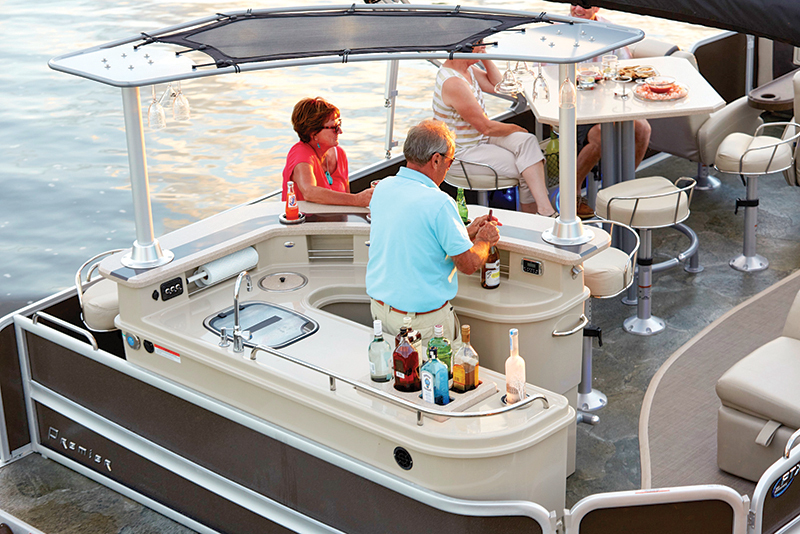 The Larson Escape, for example, features solid aluminum side panels with fiberglass bow corners. And thanks to padded interior upholstery, exposed side metal is becoming a thing of the past. 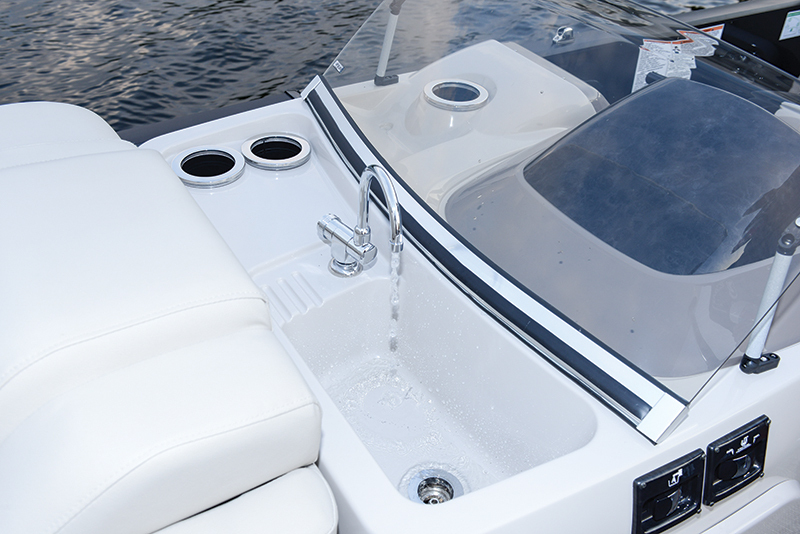 Manufacturers are using fiberglass modules aboard their pontoons, which means the boat’s helm and interior furniture are integrated into a fiberglass deck enclosure. 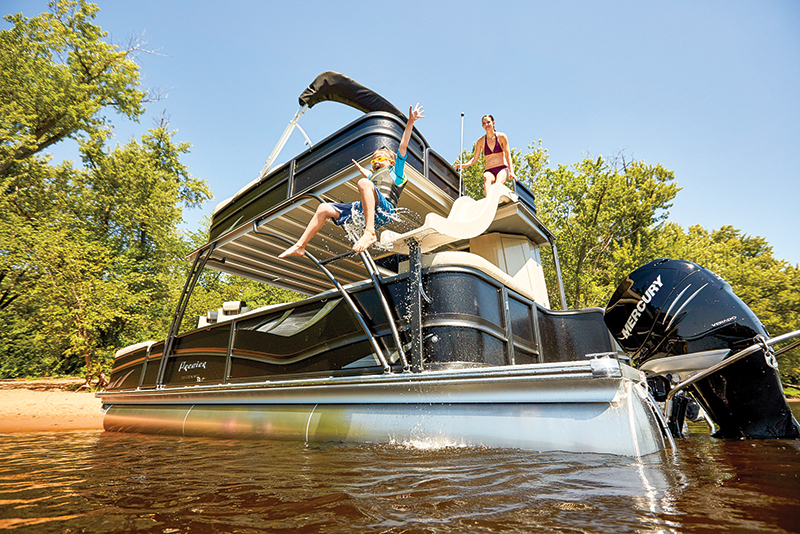 Once again, the fiberglass offers an extra measure of durability “You get the look and feel of a fiberglass boat on a pontoon hull, plus a flexible, spacious layout,” said Greg VanWagenen, Manitou’s director of marketing and communications. Other added benefits include Manitou’s raised helm station or Cypress Cay’s built-in helm cooler. Due to the sheer amount of space aboard, pontoon boats have always had flexible layouts. This is now at a new level, literally. The Escalante from Premier Pontoons incorporates a curved stairway to an upper deck, a layout that allows this pontoon to feature a refrigerator, a wine cooler, a sink and a hard-sided standup head. Oh, and a slide. “With full wraparound windshields, a pontoon will look and feel more like a sportboat,” said Matthew Vetzner, Larson’s vice president of marketing. Avalon’s Knight agreed. “The windshield models will feel very similar to a runabout,” he said. Boating should be accessible to all. To that end, Larson has added a boarding door to its Escape that can easily accommodate a wheelchair. Once aboard, of course, maneuvering the chair is manageable thanks to the pontoon’s flat, stable deck. Today’s polished aluminum sponsons definitely offer more than a mirror-like finish. They also are expertly designed to feature a shaped running surface with built-in chines and lifting strakes. Some, such as those from Bennington Pontoon Boats, feature oval-shaped sponsons rather than round ones. As manufacturers have developed additional sizes and shapes of performance tubes, they’ve been able to meet greater horsepower needs. Premier’s PTX packages, for example, can support more than 900 hp on its largest models. 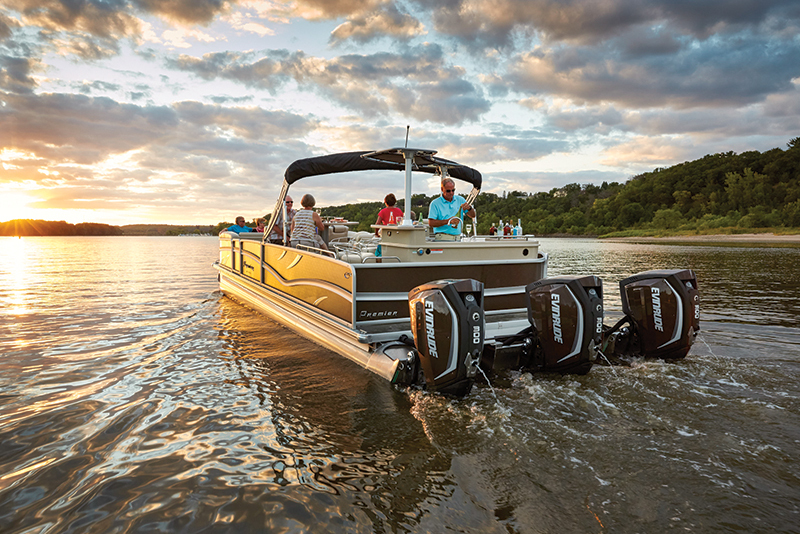 “Our pontoons offer horsepower ratings allowing up to three 350 hp engines when utilizing the 27-inch tubes and larger 42-inch PTX center tube,” said Lori Melbostad, Premier’s president. Indeed. Now that wakeboard tower with all the watersports accessories really makes sense. 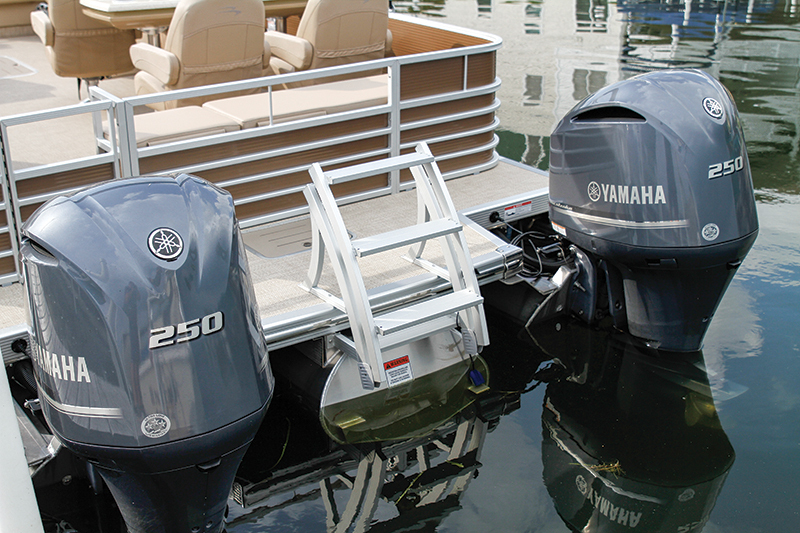 Pontoons have always been able to absorb the impact of rough water fairly well, but with the deeper middle tubes that come with performance packages, they can offer an even more comfortable ride. 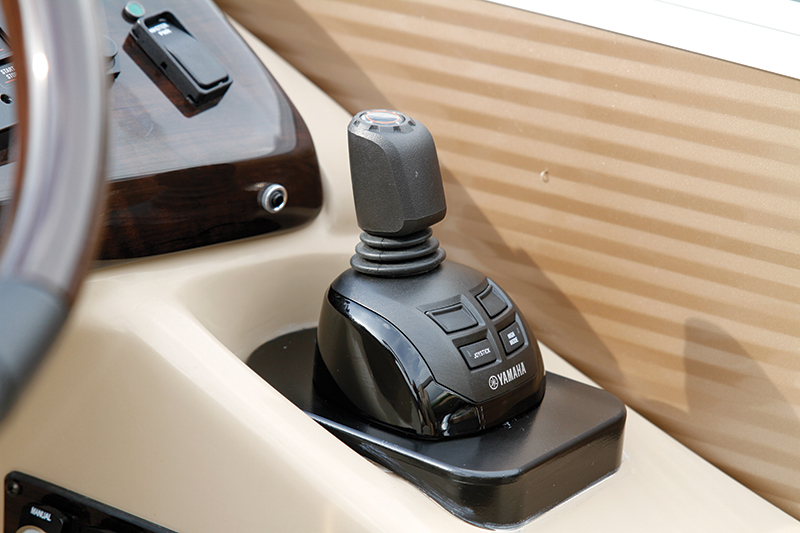 Today’s pontoon boats feature all the fun gadgets, including touchscreen electronics, GPS navigation and Bluetooth. They also boast the latest sound systems with subwoofer stereos. 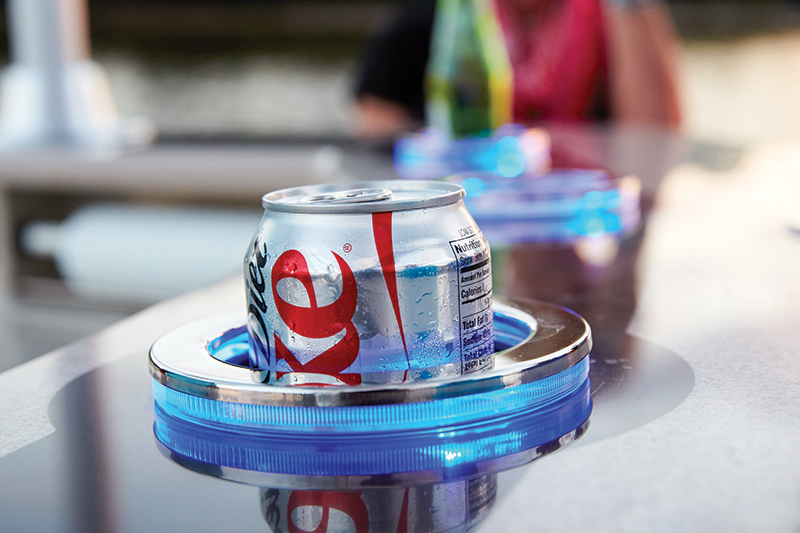 VanWagenen agreed, also observing that boat owners are willing to spend more money on their boats’ stereos, speakers — even blue LED accent lighting. “They want to entertain, and that enhances the experience at night,” he said. Plus, let’s face it, the grownups still want to feel cool. Recognizing that pontoons are indeed on-water entertainment centers for their owners, manufacturers have focused on creating spaces for built-in galley and head facilities. 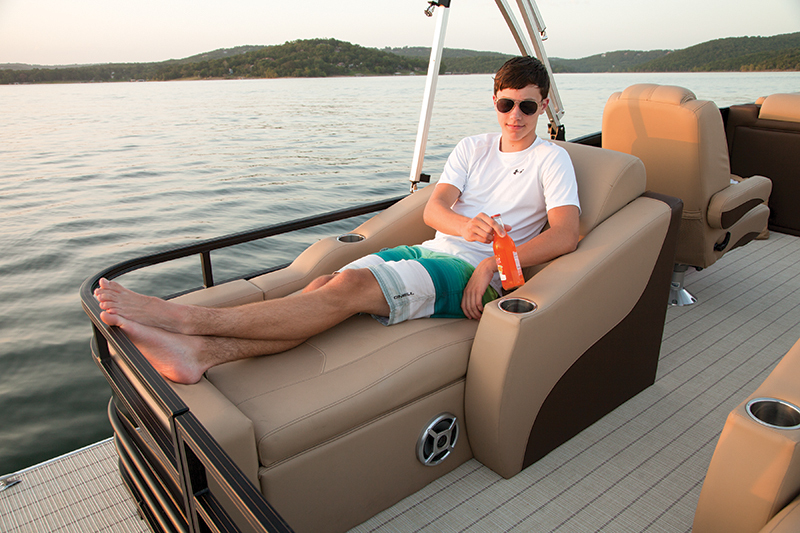 Smoker Craft’s new Lounge Arm Galley transforms a pontoon’s chaise lounge into a functional galley with a sink, cupholders and a wine bottle holder. It’s available on all Sylvan, Starcraft and Sunchaser pontoons. 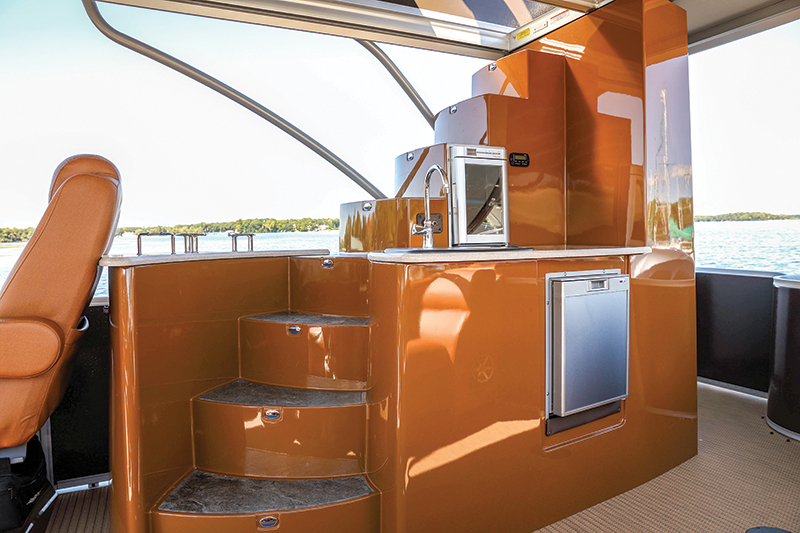 The aforementioned Escalante from Premier is able to provide a refrigerator, wine cooler, sink and standup head, thanks to its fiberglass staircase to the upper deck. Seats are seats, right? Wrong, at least according to Avalon. The manufacturer offers signature aluminum seat frames with decorative teak panels that are ventilated to keep temperatures in a moderate range and reduce opportunities for mold and mildew to grow. Cruising amenities such as galleys and standup head compartments have been game-changers for many pontoon owners, but not all of these innovations are abovedecks. Premier’s Encounter, for example, provides a cuddy cabin within its raised helm. The cabin features a sleeper, a convertible dining table, a head, internal speakers, a deck hatch and nearly 6 feet of headroom. The stigma around pontoon ownership is abating with the advent of stylized fiberglass design elements, cruising amenities and runabout-style performance. Looking forward, the biggest design trends are likely to involve performance, so the boats can go even faster, handle better and tackle offshore conditions. “We’ve gone from being the afterthought boat to the boat everyone wants, and the key is performance,” VanWagenen said. Pontoon owners want to be able to take multiple generations of family members and friends on the water, where all of them can do a little of what they like. That means the boat must be able to handle a variety of conditions; and as usage expands in coastal areas, that includes saltwater environments.